Convert Page to an Image (Removing White lines) 100dpi, 200dpi, 300dpi. PitStop 13 update 2 is a minor update. This means you can use this version using your PitStop 13 license key or subscription. We have sent an email with links to the new installers to all PitStop 13 users. If you're on PitStop with a maintenance contract, please contact your local reseller to get this update. If you're on PitStop 11 or 12 without a maintenance contract, you can upgrade your PitStop Pro license key via a reseller or through the Enfocus webshop. PitStop Server can only be upgraded via a reseller. ISO 19593-1 is a new PDF standard that is currently being developed by the TC130 committee of ISO. It regards the use of PDF layers, or ‘Optional Content Groups’ as they are called, to define the many different elements that go into making up a complex PDF file. This specification is designed for, but is not exclusive to, packaging, large format and labels. This specification was initially developed by the Ghent Workgroup and has now progressed to ISO, where it is currently being worked on, but has not yet been published. Below you can see a sample PDF file from the GWG showing how a PDF file created using this standard would look. The actual name of the PDF layer is actually irrelevant, as the attributes of the layer that make it a ‘Processing Step’ are described as metadata within the PDF file. This means the layer name can be localized in different languages whilst still conforming to the standard. There are also requirements of the objects on the different processing step layers and how they should interact with other content in the file, these cover overprint settings, blend spaces and types of object. Within this version of PitStop we include 3 new Actions to support this new standard, a Select Action, a Fix Action and a Preflight Check Action. We also include quite a few standard Action Lists to get you started. It should be pointed out that this standard is still under development and is not yet final, but we will adjust the functionality if any additional changes happen between now and final publication. We’ll also add additional functionality and Preflight Profiles in future versions. We at Enfocus think this is a very interesting and important step in creating new standards for the Packaging, Label and Large Format markets, as well as anybody else creating PDF files with special finishes or effects. That’s why we decided to release these features now, to give our users the opportunity to start to experiment with the standard. These new functionalities will give you the opportunity to test and evaluate the functionality within your production processes. You can expect to see other applications adopting this standard in the future. In our opinion these will include software driving hardware devices as well software applications and workflows. One of the largest growing markets within the printing industry is the Packaging market. Packaging is a very different animal when it comes to file creation and preflight, when compared to other parts of the industry. Files tend to be quite complex, they have lots of spot colors, they don’t typically use PDF page boxes and packaging is subject to a lot of legislation, especially when working with pharmaceuticals and cigarettes etc. The use of layers is commonplace in packaging, and typically PDF files include a lot of structural and finishing information. This poses several issues when trying to preflight packaging PDF files, which is why the ISO specification mentioned previously, is so interesting. If you’ve been following some of the new functionality we have added to PitStop 13, then you will have seen that we have added specific functionality (Restrictions) to enable users to preflight more complex files. This applies not just to packaging, but also large format, labels, conventional and digital commercial print. With this latest PitStop release we have added some specific packaging preflight functionality, but this is based on PDF files created with Esko applications. When Esko ‘Normalised’ PDF files are created, they include metadata that describes some of the attributes of objects and inks within the PDF file. The two areas we have focused on in this PitStop update are barcodes and inks. Using Esko metadata we have added some specific Actions and standard Action Lists to help check barcodes and inks, which we hope will be of interest. Barcodes in particular, unless they have some kind of marker like this metadata, cannot be separated from other lineart in a file, that’s why we think this new check will be particularly interesting. Obviously we understand that these functionalities are limited to Esko created files, but given Esko’s position in the market, we think they will be of use to a wider audience, not only to Esko cutomers. With PitStop 13.2 we offer customers the option of purchasing PitStop Server via a monthly or yearly subscription. This follows on from the release last year of PitStop Pro subscription licensing. It was always possible to import/edit and export Action Lists from within the Preflight Profile editor, but now you can also create new Action Lists directly from this location. As you can see below the interface has also changed slightly as a result. Select inside Contour was released with PitStop 13 update 1, in order to work correctly it needed a ‘closed’ contour. However it became apparent that actually fixing and closing contours is not always a good idea, in fact it can actually cause issues by distorting the Contour. Therefore this revised version will only close the Contour in order to make the selection, but this change will not be saved, it’s just done for the selection process and then discarded. The contour gaps will be closed based on the value defined in the selection. 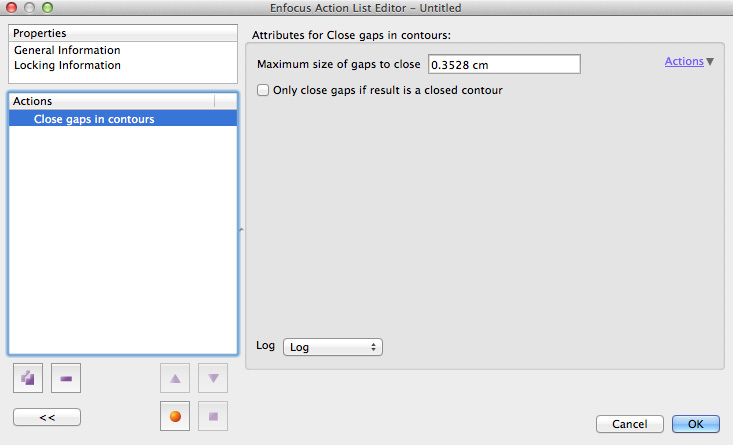 If you do wish to actually close the gaps in the contour and save them, there is a separate Action for that called ‘Close Gaps in Contour’. Preflight Restrictions were introduced in PitStop 13, and allow a more focused and accurate Preflight routine. The Restrictions themselves are based on Action Lists, and are actually selections, so you select the parts of the file you want to preflight, and ignore the parts you don’t. What we have done in this version is speed up the processing of Restrictions by allowing the selections to be ‘remembered’. This means the objects are only selected once, and then when needed again, the previous selection is recalled. This has a dramatic effect on processing, especially when there are a lot of Restrictions being used in the file. However, there is a very good reason that you may not want to use this functionality! The reason is that the selection may have changed during the Preflight process. Let’s imagine you have a selection that converts RGB to CMYK. If your original restriction was RGB based, and you then convert objects from RGB to CMYK, you do not want the original selection to be remembered, as it is no longer correct. The elements that the Restriction has remembered have changed, so it makes sense in this situation to have a new Restriction selection made when it is needed. If your Preflight routine only checks elements then this is not an issue and you can always use the ‘Reuse Selection’ option. If you are also using fixes then please be aware of the limitations. 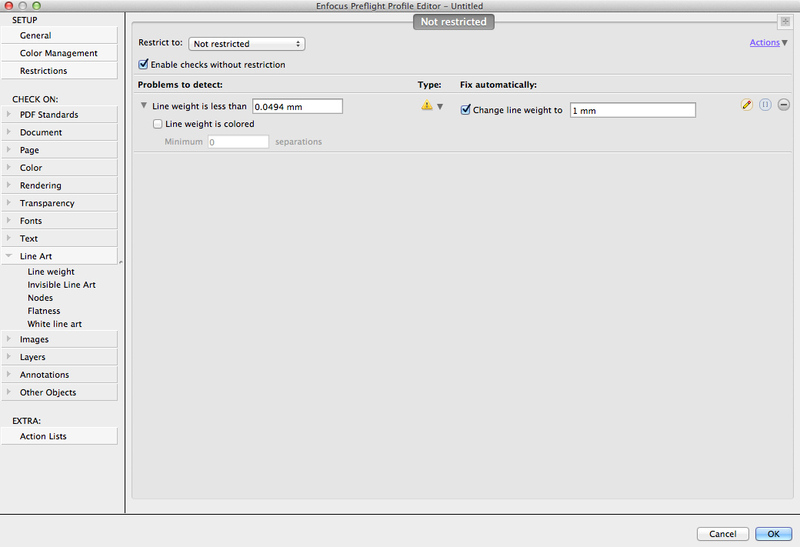 We made a small change to the automatic fix for Line Weight in the Preflight Profile Editor. In previous versions the thickness of the fix was defined by the value used in the check. This has now changed and the fix value is user definable and not related to the check. This is a new Action that will automatically remove attachments within PDF files. PDF files can be used as a container for many types of files, and these are not always necessary for prepress production, online viewing or PDF repurposing. They also add unnecessary file size, which is why customers have requested this new Action to remove them. PDF files often contain XMP metadata that relates to objects and attributes within the PDF, many applications create and store such information when a PDF is created. Whilst this information can be useful, and indeed we use it ourselves within our Switch application, many times it is not needed and can result in very large PDF files. The ability to remove object level XMP metadata has been added to the Remove metadata Action. In the PitStop 13 update 1 release we added the ability to Select N’th pages, now in this version we add the ability to Add N’th pages. This new Action allows you to check a selected object for the number of color plates it uses. This can be used with a select Action so you can check specific objects. This differs from the previous separation check, which is based on the page itself, not an object. The Rendering engine within PitStop has again been improved within this version. We now have the option of anti-aliasing, whereas before, this had always been applied. 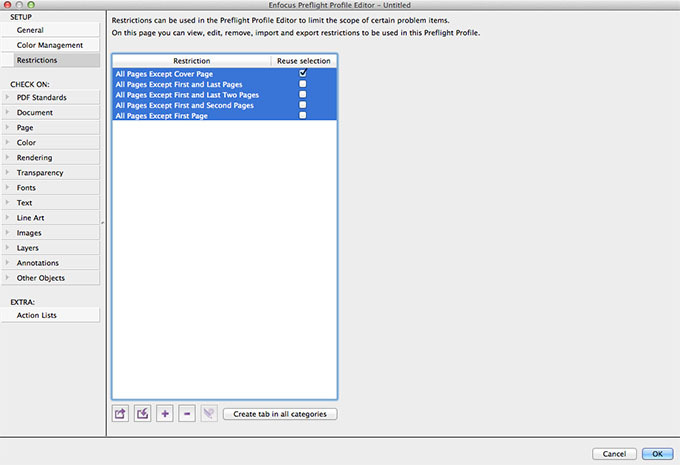 This new option is available in all the places where rendering is available in PitStop Pro and PitStop Server such as the ‘Convert page content to bitmap’ Action, and is also available in the Switch PDF2Image configurator that uses the PitStop Server Cli for conversion of PDF files to images. Having this new option opens up some interesting approaches for handling PDF files that have white lines from flattening. 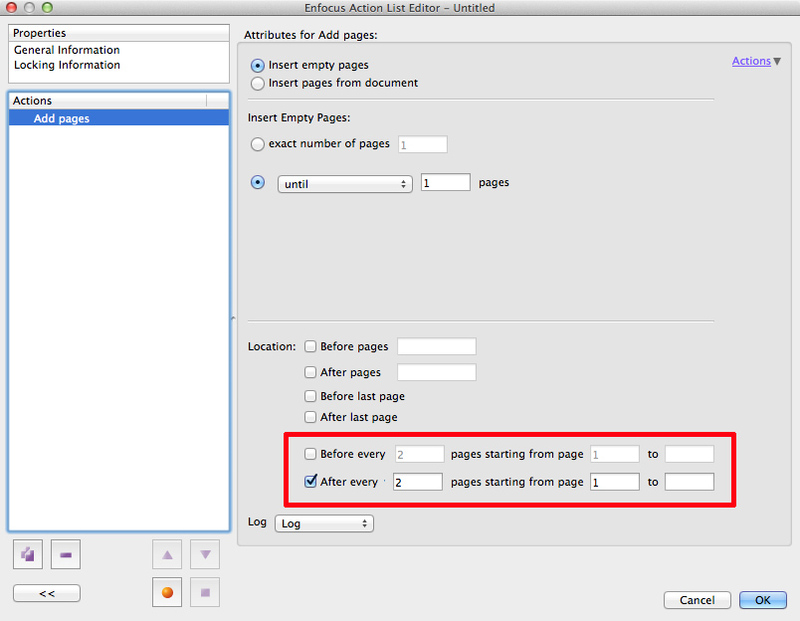 You will find a new default Action List described later in this document for those types of files. This Action uses a two pass approach one without anti-aliasing and one with, to give the best possible result. Within the last release of PitStop, we added a very new and unique feature that allows a preflight check to be limited (Restricted) to within a contour shape or shapes. This could be a cutter guide or dieline for instance. This functionality required the shape to be closed, but very often we see that these shapes are drawn manually, and therefore often have slight gaps. These gaps can be very small, and only seen when closely inspected with a high zoom factor. So this new Action closes these gaps based on a user defined tolerance. It works by analyzing shapes that have the same attributes, line thickness and color for example and then finds gaps based on the size defined in the Action. There is also an option for the gaps to only be closed if the result is a completely closed shape. This Action is a continuation of a series we have developed for improving the quality and speed of output. of complex PDF files. Very often we are sent badly created, or overly complex files that cause production delays and bottlenecks, so we are continually developing new techniques for handling them. This new Action converts fill and stroke shadings in Gray, RGB or CMYK to images based on the resolution and compression settings in the Action. Rasterizing such objects in a PDF can make the rendering of the PDF much faster when it is output or viewed, so removing the production bottleneck. Of course it needs to be recognized that it takes some time for PitStop to carry out this process, but for some customers it’s preferable to do this upfront in PitStop, rather than have a delay later on during the output Rip process. It should also be noted that this Action will result in larger final PDF files. This Action is one of the new functionalities developed to support the ISO 19593-1 standard that was discussed at the beginning of this document. As you can see below, this Action enables you to select certain layers that have processing step metadata attached to them. It’s important to note that the layers are not selected by their name, the name in fact is unimportant. 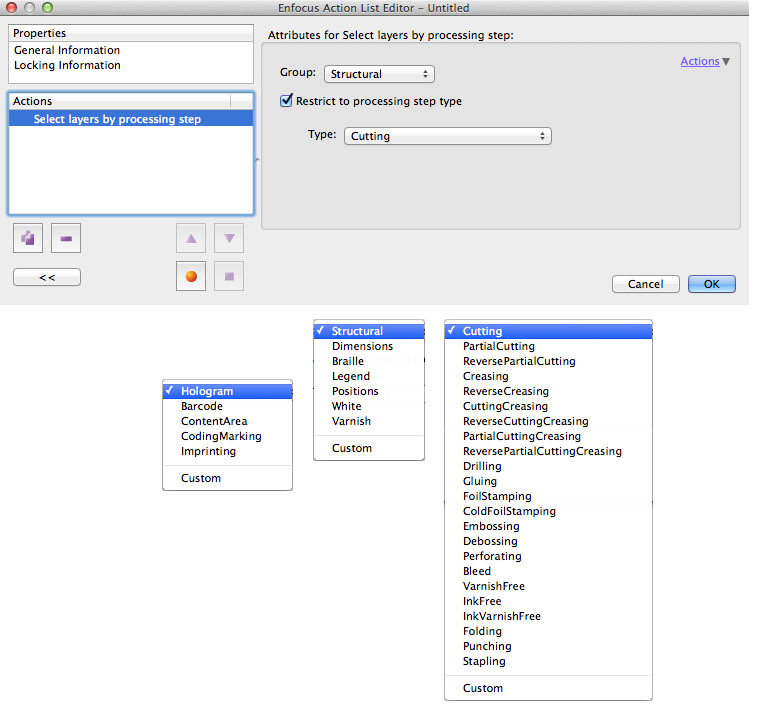 It’s the metadata attached to the layer that defines the processing step type and the attribute that we are selecting on. This Action enables you to make a layer in a PDF file into one that conforms to the ISO 19593-1 standard. As mentioned before the name of the layer is not the defining factor, it is the metadata within the layer that sets the processing step. Please note that any objects that are added to the layer should also conform to the specification, but checking this is currently beyond the scope of this Action. We will be adding future Actions and Preflight profiles to support this new standard in future PitStop versions. This Action List checks if specific layers conforming to ISO 19593-1 are present in a PDF file, if the layers are not present then a warning or error can be generated. 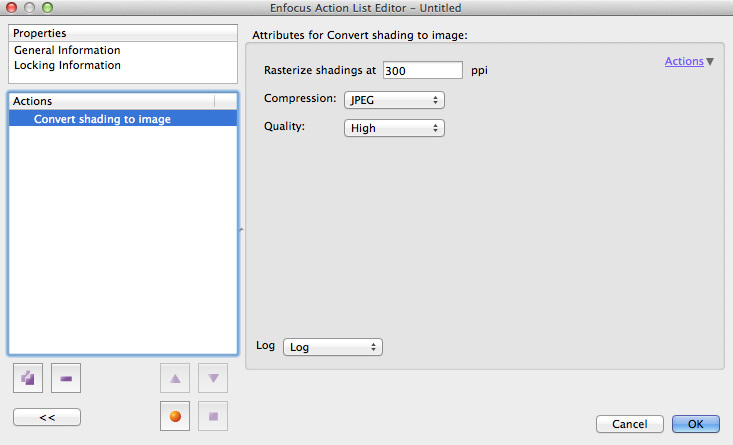 This Action removes the Processing Step metadata from a layer(s). It does not remove the layer(s) themselves, there are other Actions that can do that. It purely removes the metadata so the layer is no longer recognized as a processing step. This new Action List looks for Esko barcodes within a PDF file. As previously mentioned Esko ‘marks’ the barcode with metadata, so that we can distinguish the barcode from other objects on the page. This select Action can be combined with other Actions to create checks and fixes for Barcodes. An example would be to check if the barcode was made of 1 color plate for example, or even just to check that an Esko barcode existed in the PDF file. This Action list looks at the metadata embedded in the PDF file and enables you to select barcodes based on their specific type. This selection can be used with check and fix Actions if needed. 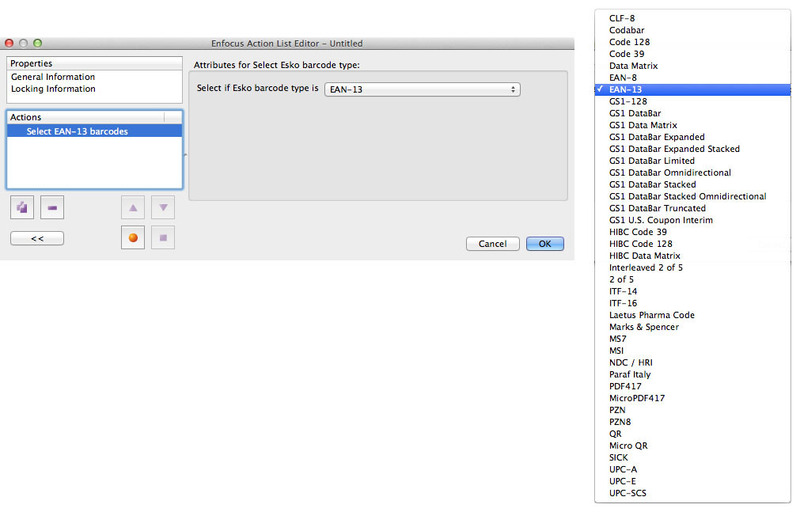 A simple log selection Action will tell you if that type of barcode is present in the PDF file or not. 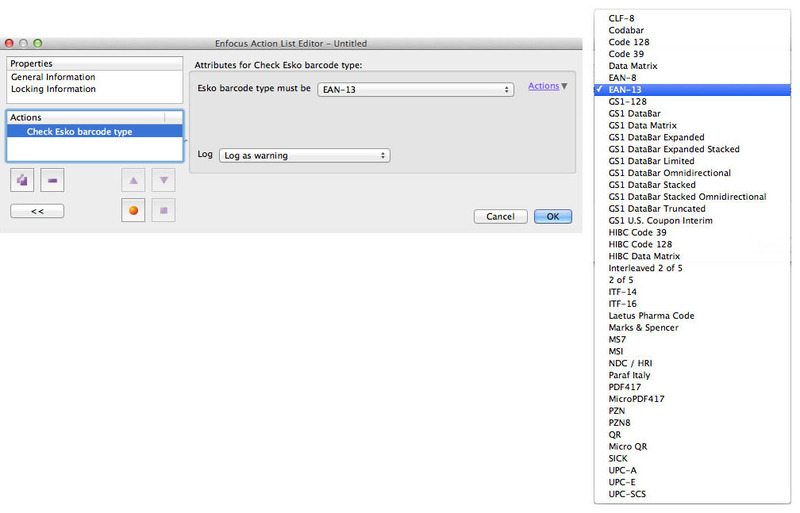 We have some standard default Action Lists already available to check for common barcode types. This Action allows you to check if Esko barcodes of a certain type exist in a PDF file. The barcodes are identified by Esko metadata that is attached to the barcode in the PDF. We have used this Action to create several standard Action Lists that ship with PitStop, you will find them in the Esko Packaging section of the standard Action Lists. Another Action to check an Esko barcode, this one checks the value used to create the barcode. This check does not look at the actual text of the barcode, many use outlined text anyway, it looks at the metadata attached to the barcode in the PDF file. If you wish to check if a barcode has a certain number then you can use a variable if you wish to be job specific. There is a default Action List that has been created using this check. That has a blank field so will report the barcode number present, but as a warning. 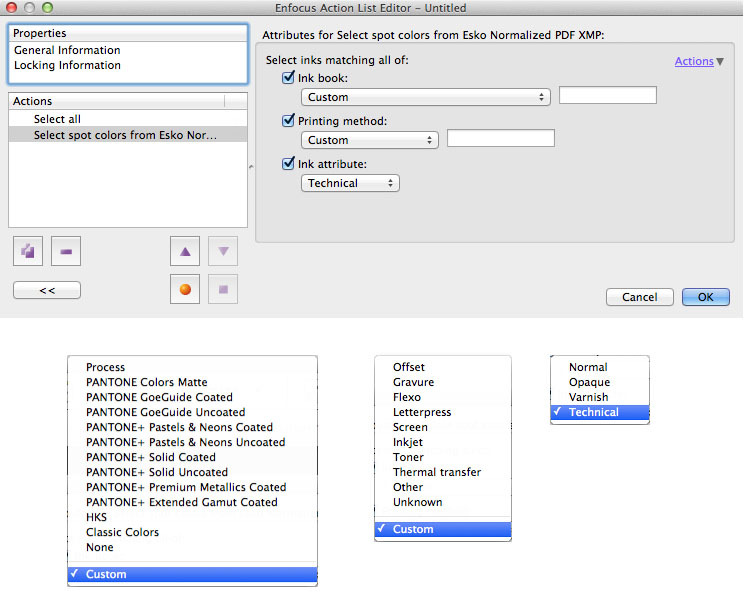 This Select Action List uses Esko metadata embedded in a PDF file to select Inks based on the Ink book, Printing method, or Ink Attribute that has been allocated to an Ink. This Select Action can be combined with a log Selection Action to find out if such ink attributes exist in the PDF file, and too which objects. We will include some default standard Action Lists that will check for specific ink types within this version of PitStop. This is a specific Action List for converting the content of a PDF file to an image and handling white lines that can be created when a PDF is transparency flattened. This Action handles this problem by creating the image in two passes. The first pass rasterizes just the images within the PDF file, and this pass has anti-aliasing off. The second pass then rasterizes all the content and has anti-aliasing on. This approach means that the images are combined without enhancing the white lines, but the text and graphics are rasterized with anti-aliasing on, thus giving the best possible result. This standard Action List uses the new Shadings to an Image Action. It converts all Gray, RGB and CMYK blends to an image, to improve rendering and redraw speeds. In some cases this may also improve the output of blends that have ‘banding’. 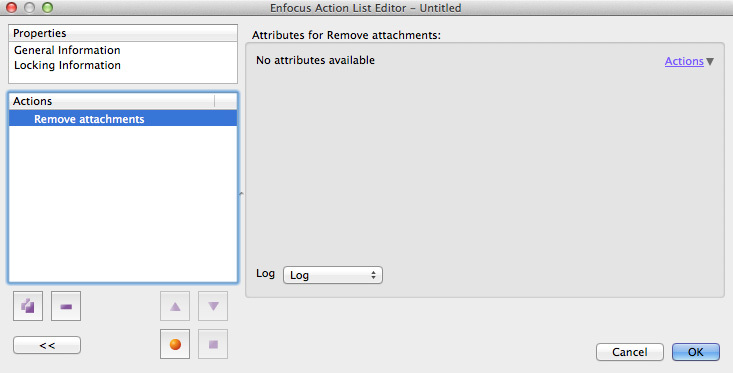 This standard Action List uses the new Remove Attachments Action to remove any attachments in the PDF file. This standard Action List has been improved by adding the remove attachments Action and the improved removed metadata Action. 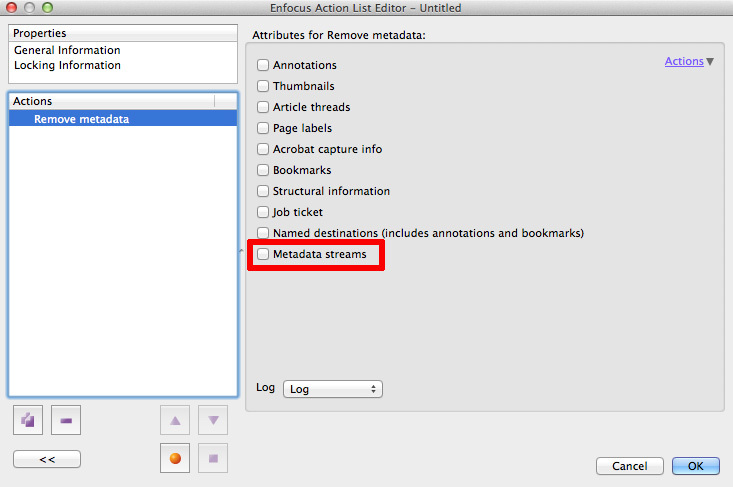 This standard Action List has been improved by adding the improved removed metadata Action. 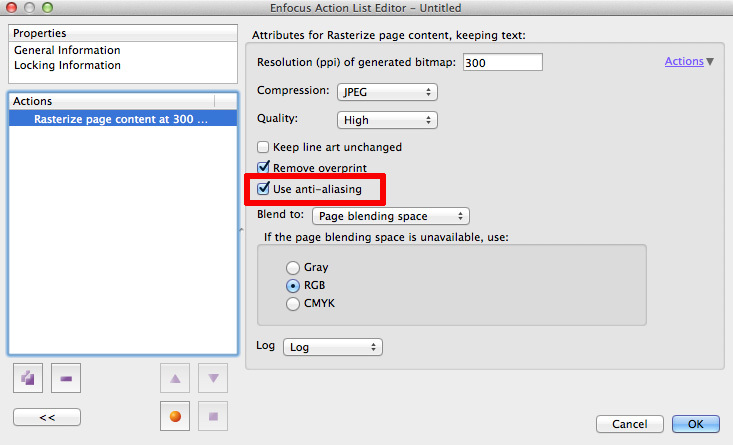 This Action List selects elements based on a defined list of Spot colors and then adds those objects to a PDF layer (OCG) which is then turned into a Processing Step layer. The list of colors can be added to, or edited as required. This Action List checks if the objects on all Structural Processing Steps have overprint, do not use transparency and each consist of one color separation. This Action lists checks the defined Processing Step layer to make sure that it actually has objects associated with it. This Action List uses Esko metadata to check for objects that have the attribute of being an ink designed for ‘Offset printing’. This Action List uses Esko metadata to check for objects that have the attribute of being an ink designed for ‘Flexo printing’. This Action List uses Esko metadata to check for objects that have the attribute of being an ink designed for ‘Inkjet printing’. This Action List uses Esko metadata to check for objects that have the attribute of being an ink designed for ‘Toner based printing’. 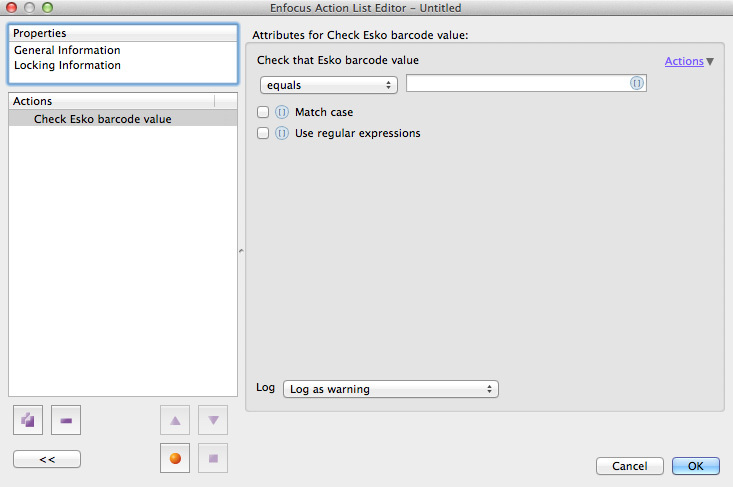 This Action List uses Esko metadata to see if a barcode of the specified type exists in the PDF file. If a different barcode type is found it will report that, and if a barcode cannot be found that will also be reported. Many Action lists and Preflight Profiles have improved translations in this version. When using PitStop Pro with a free upgrade license for the next version it should be possible to deactivate the license. German text is not fully visible in the about panel.